KUALA LUMPUR, 12 Jan. 2012 – The National University of Malaysia (UKM) in collaboration with the Royal Malaysian Police (PDRM) has since 2005 enabled 63 people mostly police officers to graduate with masters’ degrees in police science. A Memorandum of Understanding was signed in Bukit Aman today between UKM and PDRM to extend that collaboration already in place for another two years to enable serving police officers continue to do their post graduate studies. 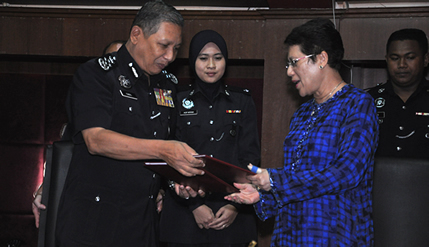 It was signed by UKM Vice Chancellor, Prof Tan Sri Dato’ Wira Dr Sharifah Hapsah Syed Hasan Shahabudin and the Inspector General of Police, Tan Sri Ismail Omar. The signing was witnessed by the Dean of the Faculty of social Science and Humanities, Prof Dr Hazita Azman and the Director of Management PDRM, Dato’ Mortadza Nazarene. Prof Syarifah Hapsah said collaboration between UKM and PDRM is beneficial to both institutions and is supportive of the life-long learning agenda of the country. The programme can assist in producing knowledgeable professional police officers who could be developed to take over the leadership of the force when their time come, she said. Currently 22 senior police officers and three officers from the Armed Forces are taking the three semester (18 months) masters’ programme since Dec 1. She expressed confidence that the MOU will enable UKM as a research university to carry out research as well as joint studies for example on discipline. Tan Sri Ismail said police work has now become more challenging which needed new strategies to meet the exacting current needs to ensure the force will always be ahead of political, economic, social, technological and environmental developments. He was confident that such formal studies will produce more knowledgeable and mentally alert officers equipped to meet the onerous demands of modern society. Exposure to such formal studies based on theories can be beneficial to the officers in carrying out their normal daily duties as police officers. It will also increase their level of competency and be able to address issues pertaining to their work whether domestically or internationally, Tan Sri Ismail said.